It is construction system, established by combining the ceiling and base profiles produced by HekimStructureRobot technology using the galvanized sheet; with carrier corners, C - U profiles, bolts and screw connections. Painted galvanized sheet + HekimPor (EPS) + Painted galvanized sheet in combination with Hekim Sandwich Panel is used for outer and inner walls. Ceiling: Painted galvanized trapezoidal sheet + Physician (EPS) + Painted galvanized sheet in combination with Hekim Sandwich Panel is used. Base: The carrier system base, which is formed by combining galvanized steel profiles with bolted and screwed connections, is covered with Hekim TPO membrane on HekimBoard Natural Cement Plate. HekimPor (EPS) is used in sandwich wall panel and roof panel insulation. The outer door is a galvanized sheet door and cylindrical lock. Interior doors are MDF-Lam door. Double glazed, white colored, PVC joinery. 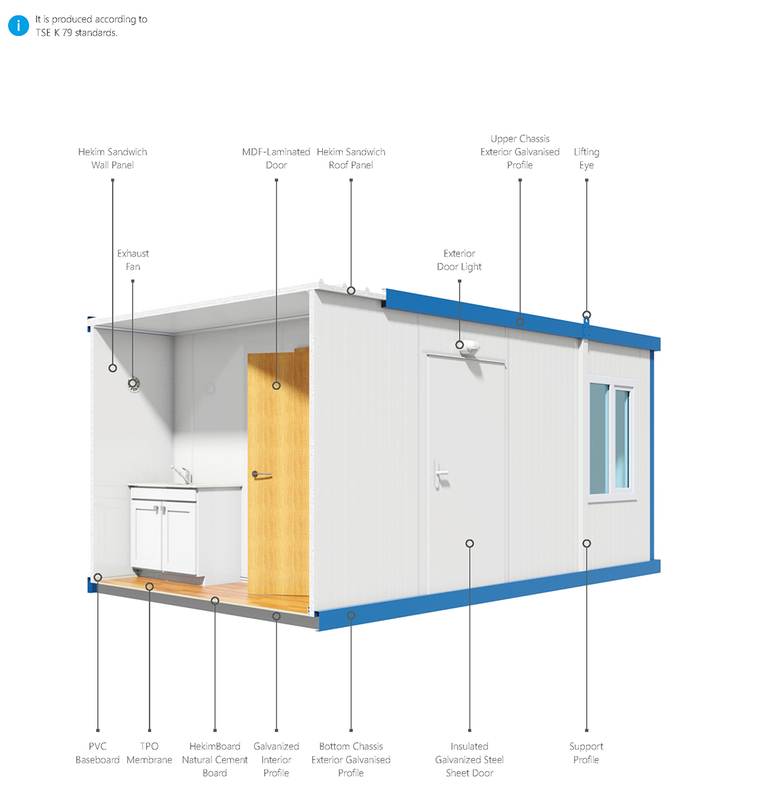 It has roof panel, wall panel and accessories painted sheet. Galvanized bottom, top and corner outer profiles are used galvanized paint. Lighting fixtures, switches, sockets, cable - ducts, fuse - fuse boxes consist of the telephone line and the leakage current relay. Wall mounted ceramic washbasin, waterproof, specially designed single-piece floor covering with shower compartment and chrome sink 50 x 100 cm kitchen cabinet, WC paper holder, soap dispenser and mirror.